When dressing for Oktoberfest it’s important to put some thought behind it in order to look the part and look your best! If you are planning to go to Oktoberfest in Munich, Germany or Melbourne, why don’t you dress up in an Oktoberfest “Costume.” You can opt for some authentic lederhosen or dirndls. Keep it simple and get high quality, hand stitched items – like these: lederhosen or these: dirndls. Here’s are how to guide on how to dress for Oktoberfest in Melbourne. 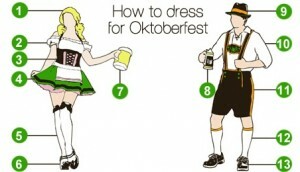 Below is a guide to dressing for an Oktoberfest costume party. 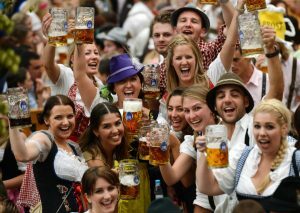 Beer lovers in and around Melbourne will be rubbing their hands together with anticipation of the much-loved annual event that is Oktoberfest. In Melbourne, Oktoberfest is nothing short of legendary. Year on year, Oktoberfest is becoming one of the most exciting events to go to, and many Australians jump on this fabulous opportunity to don some lederhosen and let their hair down. Back in 1810 a tradition was born. It is a tradition that has not only been upheld wholeheartedly to date, but has also been embraced by citizens of countries all around the world. Oktoberfest is one of the best-known annual celebrations in the world, and as it never gets any less entertaining, the chances are it is set to continue into the next century! In Munich, Germany on 12th October 1810, Bavarian Crown Prince Ludwig married the Saxon-Hildburghausen Princess Therese. When all the citizens of Munich were invited to join in the festivities, an unforgettable party ensued. This party went on for five days, with revelers celebrating the matrimony in the fields just outside of the city gates. From then onwards, celebrations were repeated each year in Munich, and they earned the name Oktoberfest. Oktoberfest became the world’s largest beer festival, but 5 days was clearly not enough! The festival now goes on for 16 days, during which time more than 6 million people swig back an unfathomable 1.5 millions gallons of beer.